It's that time of the year again for my cupcake extravaganza. Well, actually, this year is not so much an extravaganza than a good experiment. The amount of baking and varierty from last year's birthday cupcakes got a little out of hand as I was quite ambitious. Since I've been very busy with different areas of my life, I decided to cut back on the complexity but stay away from the same-old-same-old. 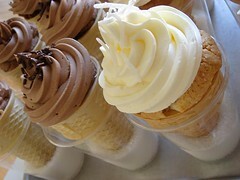 For friends in my skating club, I baked a couple dozens of ice-cream cone cupcakes in conservative flavours (chocolate cake with mocha buttercream, coconut cake with vanilla buttercream) that were packaged individually so that my friends can choose to enjoy the cake later at home. For friends at work, I made cupcakes inspired by traditional asian flavours that I grew up enjoying. These flavours can be a little challenging to uninitiated palates but since many of my coworkers are either asian or tasted my baked goods numerous times before, I wasn't worry that they might find the flavours too weird. 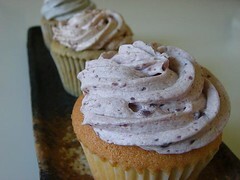 First up was a green tea pound cake topped with azuki bean buttercream. This is an encore from last year's selection because I was very pleased with the result of mixing sweetened azuki bean paste with buttercream. The other two flavours were results from a shopping excursion at T&T Supermarket. I love to browse at supermarkets, paying close attention to every little merchandise available. In a large ethnic grocer such as T&T, I can always count on finding unexpected discoveries. This time around, I found in the frozen section packages of ready-to-use sweetened black sesame paste for filling mochis. It is the perfect companion to the roasted grinded black sesame that I use regularly on my breakfast cereal. 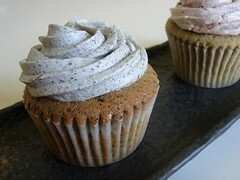 I made a black sesame cupcake using pound cake with grinded black sesame and buttercream flavoured with black sesame paste. The result couldn't be more perfect as every bite of the cake was intensely flavourful. Another great find at T&T was frozen packages of Philipino taro (ube). This deep purple root vegetable is often associated with creamy dessert in the asian sweet kitchen such as ice-cream. I had never worked with ube before but I was determined to replicate one of my favourite ice-cream flavour in the form of a cupcake. The only way that I could do so was to taste-test at every stage of cooking and experiment until it is "just right". I figured as a root vegetable, I probably want to make the ube into a sweetened paste to incorporate into the buttercream. I couldn't tell if the defrosted grated ube was cooked, so I tasted a little...it was indeed raw and tasted rather gross. I decided to steam the grated ube until it tasted cooked. To sweeten the mashed ube, granulated sugar just doesn't cut it because it was simple sweetness without richness. Instead, I took a cue from halo halo and mixed condensed milk and coconut cream with the mashed ube to form a rich and delicious purple paste. The buttercream did not have even a drop of food colouring...the light purple was due to the natual colour of the ube paste. I can think of so many uses for the ube paste that my mind is already filled with ideas. Isn't it wonderful to explore new uses for old favourite flavours? I received an invitation from AL to attend a charity ball held last Sunday at the Liberty Grand. It's been a couple of years since I last purchased a party outfit so I started to get a little bored of my old standbys. On Friday, I decided to try my luck with finding "the right dress" at Bayview Village after work. Anyone with a similar shopping mission two days before the big day can probably tell you that the chance of returning home empty-handed is highly likely. I dared not bring my hopes up. The boutiques at Bayview Village target more wealthy clientale so I guess it makes sense that I had hundreds of different party dresses to choose from. At this time of the year, it is too early for Christmas and too late for prom. Therefore, in a typical neighbourhood mall, I would be hard-pressed to find even a decent selection of party dresses. Perhaps there's a charity ball season that I'm not aware of? In any case, having choices is good. I went into Mendocino with a Betsey Johnson pouffy dress in mind. However, on this visit, the same dress that looked so cute on the mannequin a couple of weeks ago just screamed 80's prom to me. I had my eye on a very low-key dove grey chiffon dress by Helen Wang instead. The empire waist is made with a wide band of silvery grey satin showcasing elegantly the V-neckline. The pleated chiffon swayed languidly with every step that I took. I loved the cut of this dress so much because it was so slimming. However, the main reason that convinced me to make the purchase was more practical: this dress managed to cover up all my scars from inline skating without looking dowdy or like a sack! What more can I ask for? On the day of the party, I wore this dress with heels that were way too tall to be manageable. It was the first time since I bought those shoes from Paris that I have an occasion to wear them. They look devastatingly beautiful. I felt a little self conscious about the sleeveless dress so I layered my black lace shrug over the dress. The black satin ribbon on the shrug was knotted into a bow to echo the satin bows on the shoes. After a whole summer of lycra, spandex, CoolMax, and mesh, I enjoy getting dolled up for a party and reaffirm that I am capable of looking pretty. During my search for a SuperGirl costume in Thornhill, I had a chance to visit The Finnish Shop in a plaza on Yonge that I normally wouldn't even dream of pulling in. Off the top of my head, I don't know of a prominent Finnish cultural group in Toronto so it was the perfect opportunity to ask a few questions. Of course I'm most interested in Finnish restaurants. However, according to the lady at The Finnish Shop, there really isn't any in Toronto or even Southern Ontario. For a taste of home, they would instead visit Viking Deli Smokehouse & Bakery for some smoked fish, smoked meat, and traditional baked goods. That's the story of how I ended up in this homey purveyor of all things Finnish. 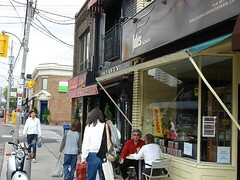 The deli shares store space with Milbree Catering. As soon as I walked through the door, the aroma of smoked meat was unmistakable and I was greeted by two grandmotherly ladies who were in charge of the counter and buffet table. Did I mention there was a buffet ladened with all sorts of Finnish delicacies for sampling? It must have been my lucky day because they were hosting a tasting promotion. I had a bit of liver casserole with lingonberry sauce (yum! ), smoked ham, smoked turkey, puffs filled with veal and rice, and fresh strawberry cake. 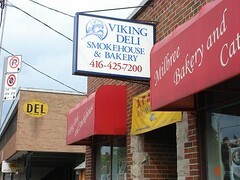 Viking has a good selection of house-smoked whitefish, salmon (hot- or cold-smoked), ham, and turkey with the ham and turkey being the most memorable. Both of these are deli-standards found everywhere but it was the first time that such humble food registered as delicious on my tastebuds. The smokiness added complexity to the moist meat. I was told that the Finnish Coffee Braid is not-to-be-missed. It was indeed delicious as promised. Don't let its appearance fool you as the braiding is probably the only thing it has in common with challahs. The loaf smelled devine with cardomom and nutmeg which recalled memory of masala chai in India. 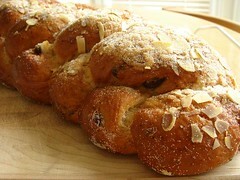 The bread was dusted with sugar, spice, and sliced almonds with juicy raisins hiding inside the bread. This is a soft fluffy bread similiar in texture with hot-cross buns. Personally, I found it a joy to eat and it was hard to just nibble either. This is a great alternative to breakfast breads. I originally planned for a weekend full of skating but the weather was unpredictable enough that all plans were postponed. On Saturday morning, I was in the enviable position of being awake with nothing to do. Well, this is a perfect opportunity for me to catch up on some eating so I visited Jules Cafe Patisserie in Leaside, just a few doors down from Le Comptoir de Celestin. When I did my first patisserie walking tour at this time last year, Jules was not yet open for business. 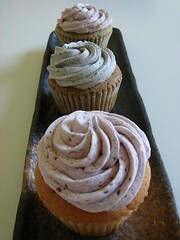 Since then, it has generated some buzz as a friendlier alternative to Celestin with equally delicious cakes and breads. I was eager to find out for myself. The minute I stepped into the store, I felt that it is a little haven for francophiles. French conversations were frequently heard and it has the atmosphere of a neighbourhood pastry shop in Paris. There was an endless stream of regulars who drop by for sandwiches, a little bag of buttery cookies, and their daily baguettes and viennoiseries. There was a small selection of fancy individual cakes but I suppose that's not the focus for Jules. I sampled a number of pastry shop staples including a tarte au citron, sable breton, pain au chocolat, brioche, and baguette. 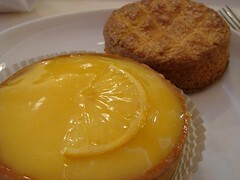 Personally, I think the sable breton was the best followed closely by the lemon tart. The sable was crumbly and buttery with a slightly salty taste. Some people may find it dry but it would be a great accompaniment to a cafe au lait. The lemon tart had a very puckery curd filling. The glaze was not intrusive and the crust was quite crunchy, though it could be more tender. The pain au chocolat and brioche fared not as well as neither tasted buttery enough. The pain au chocolat was very flakey but the layers were not uniform was some large air pockets inside. My standard for baguettes is not very scientific but highly personally subjective. 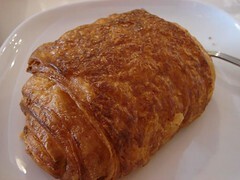 During one of my trips in Paris, I wandered over to Poujauran after a hearty breakfast and bought a demi-baguette. On my way back to the apartment, I could not resist tearing off piece after piece of the delicious bread with a thick shattering crust surrounding a soft white center. The whole loaf was devoured by after a short 5-minute walk. 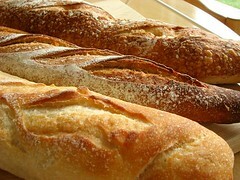 Since then, I decided that a good baguette must have this kind of irresistable quality. Unfortunately, neither the baguettes at Jules nor Celestin fit this description. Perhaps it was a humid day. Of the three sticks that I purchased, only the sourdough baguette at Celestin had a crunchy crust. It also distinguished itself with the complex taste unique to sourdough breads. My search for a good baguette in Toronto continues. I didn't fall off the face of the earth (at least as far as I know). It's been an insanely busy week with traveling, racing, dessert night at Linda, work deadline, and family obligations. I'm sleep deprived but have so much to write. Looking forward to share some of the highlights in the next couple of days. Pinkie swear. I dropped by Bayview Village after work today to pick up a baby gift for AL's newborn nephew. It's that time of the year again when all the stores are stuffed with new fall fashion and all the reduced price summer merchandises are hidden out of sight. All the hot seasonal items are prominently displayed and it's a joy to shop. Some trendy items this season include leggings, tunics, the whole dress over skinny pants silhouette, and my personal favourite, leg warmers. I'm glad to see that some of my wardrobe staples are finally "in style". However, what really caught my attention today was all the pretty evening dresses, styled to be worn in unexpected layers. I saw a gorgeous Betsey Johnson gown that looked sweet on its own but was modern when paired with capri-length legging and a cap-sleeved lace top worn under the dress. There are many jersey knit dresses that drape so elegantly. I think they would look very flattering too. I also spotted some cute cable-knit capri-length legging that would look great with a baggy top cinched with a nice belt. Or better yet, I would probably wear it with one of my many plaid pleated mini skirts. It was rather tempting to see all these pretty clothes yet as soon as I think of my brand new skates, I turn frugal and remind myself that I should spend my money wisely. After all, the enjoyment that I derive from my sporting activities far outweights a beautiful dress. On a food-related bit of news, Sen5es no longer has a shop in Bayview Village. That's a real pity because now I have to travel much further south to get my hands on their delicious pastry. Our softball team had a full day of tournament today and that wrapped up another season. It's a little sad to see the team together for the last time because many of our teammates will not return to play with us next season. However, having said that, it was a fun day playing ball. If you've been following my blog for a while, you probably know that I'm a magnet for injuries when it comes to softball. Although I didn't play too many games this season, I still managed to get an injury that kept me out of any sporting activities for 10 days. At last year's tournament, I sprained my ankle at the last game of the day and that injury took a long time to heal. With such a track record, I was extra careful today to avoid hurting myself. In game 3, things got very tense because our team must win the game to qualify for the finals and we were in a tight battle. Hitting is not my strength but I can reliably get on first base because I can dash at a reasonable speed. I was running from first to second when I saw the shortstop fumbling with the ball. If I play it safe, I should stay on second base but I decided to take a risk and ran for third. I could feel the ball flying by me and knew immediately that it was a fight between me and the third baseman. I got a little flustered, tripped, and did a face plant on the base. My right shin got a good bruising and the shock of the fall left me motionless on the ground. Among all this confusion, I heard my teammates calling me to go to home base yet I was in pain. Turned out it was an overthrow (ha! The second baseman got psyched out by my running so he messed up his throw!) so I got to walk home. I feel so lucky that it wasn't anything serious. I need my legs to be in good shape for the big inline skating marathon in Duluth! This question is often asked on Canadian food-related forums. Poutine is an obvious answer and most people would agree that this fat-ladden delicacy is indeed uniquely Canadian. A midday dish of poutine during a day of snowboarding is unbelievably satisfying. It is also one of those rare occasions when I don't feel so guilty about stuffing my face with fries, cheese curds, and gravy. However, there's another Canadian specialty that is also very delicious but far less well-known outside of La Belle Province. Cretons is a spread made with pork, a kissing cousin of rillettes. It is often enjoyed at breakfast on toast with mustard. Outside of Quebec, you'd be hard-pressed to find cretons on any breakfast or brunch menu. A few years ago, a coworker went to visit his family in Montreal. I had a craving for cretons so I begged him to bring me some from home. I never forget his look of incredulous because it is, after all, a very predestrian and humble food. 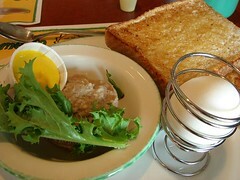 Nowadays, when I get a craving for cretons, I go to Cora's/Chez Cora for breakfast and order cretons, whole wheat toast, and a soft boiled egg. If I feel especially Canadian, I would even have some baked beans! I had a road trip to Ottawa last weekend and of course my meal options during the drive was one thing that got me thinking. I've written about my weariness toward service stations before. This time around, I decided to do a little planning and pack a decent lunch instead. If I may say so myself, the sandwich was outstanding. The sweetness of the cranberry foccacia pairs well with the flavourful filling. The loaf of bread was a neat flat rectangle which I sliced across in two. After I filled the bread with meat and cheese, I replaced the top half and sliced the bread into four which I wrapped individually with parchment paper. The parchment paper kept the bread from drying out yet it allows the sandwich to breath. Roasting sweet red pepper in my little toaster oven was really easy. The cheesecake was individual-size domes which I baked before and stored in the freezer for unexpected situations. All I needed to do was to pop one cheesecake from the flexipan and let it defrost during the trip. It was an absolutely delicious alternative to the bland and greasy service station food. Did I mention that next to breakfast, picnic is my favourite way to dine?